Trail of the Lost Dutchman. 1939. Trail of the Lost Dutchman is Barry Storm's first book. Published six years before the more famous Thunder Gods Gold, both remain important milestones in the genre's history. The plan of the book is as follows. The first eight chapters tell a story woven from tales about the Peraltas and the Apaches, about Jacobs and Ludi, Walz(sic) and Weiser, even Adolph Ruth. Several chapters follow that use evidence, reason, and deduction to locate lost Spanish mines in the Superstitions. The last section is unique. Here Storm presents the first example of what I call his "guidebook" style wherein he provides the clues and evidence as he invites the reader to join in the adventure. As Barry says, "May you be the one to find it!" Finally, as in all later works, he makes illuminating use of photographs and, as always, offers his interesting interpretations of the physical terrain. 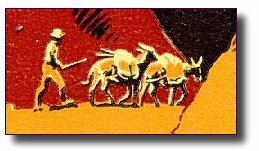 Even though Trail of the Lost Dutchman is not the first book about the Lost Dutchman Mine, it (and Thunder Gods Gold) serve as powerful models for later writers on how to approach the Lost Dutchman mystery. Contrast Storm's work with Oren Arnold's older book. Even though he and Storm tell the same tale only Storm actually looked for lost mines and treasure, actually went on "expeditions" into the Superstitions. Only Storm examines and interprets Spanish miner's symbols, finds clues on treasure maps, looks for evidence in the field. Arnold's work offers no model for dealing with the Lost Dutchman mystery - Storm was the first author who actually went out and looked, then came back and wrote about it. This approach as well as his fascination with treasure signs, symbols, trail markers and such, are standard themes in later works and continue to fascinate Dutchman writers. There are several interesting stories about the genesis of Trail of the Lost Dutchman. One obvious reason it is such an interesting book is the role a young Barry Goldwater played in getting it published. Barry Goldwater tells most of the story in his introduction to Tom Blair's book; about how he came to underwrite its publication and about his trip to the Superstitions with Storm. Not only did Goldwater's store publish the book, Goldwater himself took some its photographs. However, as you will see, there is more to the story than Goldwater revealed. Storm's book raises an interesting puzzle. Not only is it his first book it is also his most "normal" book. In literary terms this is his most successful effort - he never wrote better nor produced a more handsome volume. 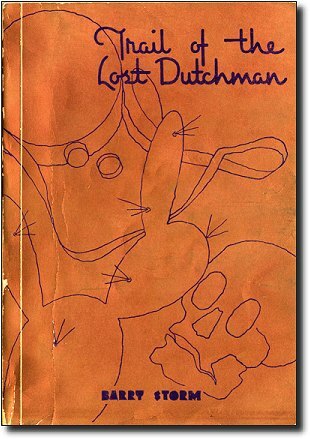 Not only is the grammar and writing style better in Trail of the Lost Dutchman than in later works, the look of the book displays an elegant aesthetic flair never repeated. In fact, the whole book displays a restraint or style rarely present in anything else Storm wrote (see the next entry for more on this). Does this mean Storm had help with the book's production? From the Dons? It is unclear what, if any, his connection was with The Dons, although they wrote the preface (Storm describes them on page 10: "The Dons; The Dons are a group of forty young men whose interest is perpetuating the history and lore of the Southwest. Every spring at the end of February, during the full of the moon, they conduct a Trek into the Superstition Mountain. If you share with them a love of adventure, the Dons invite you to follow the golden trail!"). After I wrote this section Tom Kollenborn informed me that, yes, in fact, Barry Goldwater's father did hire someone to help Storm put this book together. I don't know the details, but I think anyone who reads these books will agree that the help was significant! Another question about the genesis of this text is raised by the fascinating correspondence between two writers, Leland Lovelace (real name Bessie Loveless) and J. Frank Dobie. Their correspondence dates from 1939, shortly after publication of Trail of the Lost Dutchman. In Loveless' letter she complains to Dobie that Storm took her in, misrepresenting himself as an investigator of the Lost Dutchman mine story, hiding from her the fact that he too was a writer. She let Storm read a manuscript she was writing on the Lost Dutchman mine which, she claimed, he then used in his own work without her permission. She obviously was upset enough to complain to Dobie about it. In his letter back Dobie agrees with her assessment that Storm's work is a poor little book, not of much value. Well, history has proven them wrong on that point, though maybe she should get more credit than Storm for some of its content. CM: "Storm's first and best work on the Lost Dutchman and the lost Spanish mines of the Superstitions Mountains of Arizona. One of the two best books ever written on the subject, second only to Sims Ely's fine work."